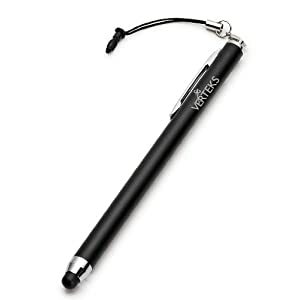 For people who want to write and draw on the iPad—try Verteks Black Touchscreen Stylus! I’ve had my iPad 2 for about two months now (give or take a couple weeks) and recently I found the need for a stylus. I’m not a drawer or anything, but I definitely like to write. Sometimes though, I prefer handwriting to typing. I typed in “iPad 2 stylus” into a search engine to see what would come up. I was presented a variety of options, many of which were a little to pricey in my opinion. The stylus I settled for was a cheap one I found on Amazon made by Verteks. At the moment, it’s listed as being only $6.25, not including tax, shipping and handling of course. It’s also a very simple stylus, as you can see from the image below. For those that want a pro/con breakdown, here it is. -Very lightweight & does its job. -There’s a dangling thing that connects to the iPad 2’s earphone jack so when you’re not using it, you can hang it there to keep from losing it. -If you don’t like the dangling thing for whatever reason (maybe it makes too much noise, annoying to feel it while you’re writing, etc. ), that’s okay. You can remove it. It’s a clip-on. -It writes well. You don’t need to press too hard on the screen. -Also works even if you’re using a screen protector like Zagg Invishield. -Cheap. It’s only $6.25 on Amazon (not including tax and S&H). -For people that like to press hard, the rubber tip might be too thin for you. I can see a hole happening, but again, you shouldn’t need to press too hard in the first place. -It’s not colorful. If you want a more colorful stylus, be prepared to shell out a little more money. If you’re interested in purchasing it, click THIS LINK. To go along with this purchase, I recommend the Noteshelf app from the Apple app store. It allows you to choose the type of paper (plain, ruled, gridline, etc. ), passcode lock your notebooks, make multiple notebooks (displayed iBooks style), titling your books, and wrist protection as you write. The wrist protection isn’t 100% perfect, but it does work for the most part and I really like using this application. It’s a paid app at $4.99, but I think it’s worth it. However, there are also free options available—I just didn’t think they worked as well (and I’ve tried quite a few free apps). Anyway, that’s it for now! See you all again next entry! Noteshelf is cool I just wish it had cloud support so you can access your notes anywhere. That’s all it’s missing. Penultimate is also a great stylus note-taking app. Noteshelf has a much prettier user interface and more bells and whistles but Evernote bought Penultimate so now all your notes get automatically synced with Evernote and you can access your notes from any device. To me that is a clutch feature. Plus it’s free. Thanks for the recs! Hopefully it helps out those looking into other options.